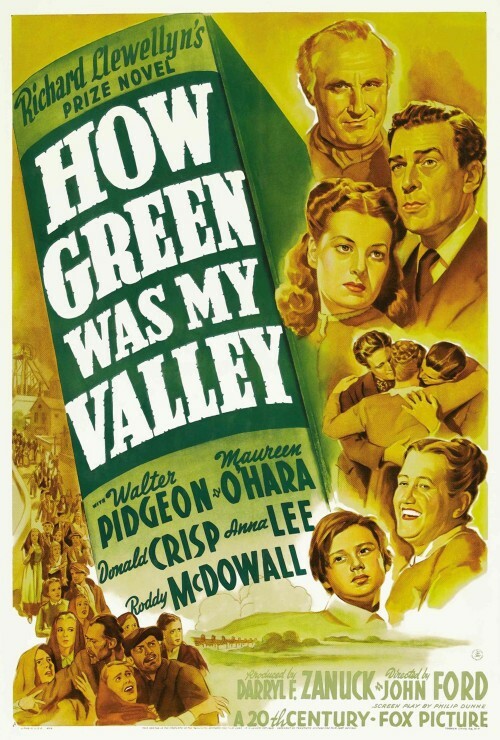 Among cinephiles How Green Was My Valley is known (and often reviled) as the film that beat out Citizen Kane for the Best Picture Oscar. But it was much loved in its time, and this tender story of a mining family in 19th century Wales, based on the 1939 novel by Richard Llewellyn, is still loved by many. Fortunately, it's not my job here avenge Orson Welles’ trophy mantel, but rather to evaluate the churches and clergy in the film. We can deal with the church fairly quickly. It's awful. Sure, they sing some decent songs, "Guide Me, O, Thou Great Jehovah" and "Let All Things Now Living" (cutting edge music, since the hymn was written in 1892), but in Welsh, so I couldn't follow them. But what makes the church awful is their practice of Deacon's Meeting, where sinners (which the deacons should remember includes us all) such as unwed mothers are publicly rebuked and humiliated. Maureen O'Hara as Angharad (can't believe we missed that name when our daughters were born) rightly points to the example of the woman caught in adultery forgiven by Jesus, but the practice continues, later to be used for unsubstantiated rumors about Angharad herself. Even the pastor of the church, after years of service, rebukes the congregation for lacking the love of Christ or appreciation of His sacrifice. The reverend's assessment seems pretty accurate. So let's move on to the clergyman in the film (by credits, he’s the star of the film, though the lead is really child actor Roddy McDowell as Huw). Walter Pidgeon plays the pastor, Mr. Gruffydd (those Welsh sure have mad spelling skilz), an educated man, from the University of Cardiff, who has chosen to serve the people in a mining community in South Wales. He gets credit right off for choosing a simple life, a poor life. A major thread is the plot is Mr. Gruffydd’s and Angharad's mutual attraction. One assumes, Hollywood being always Hollywood, that eventually they'll get together. But (spoiler) they don't. The Reverend knows he won't be able to provide for a family in his current ministry. Though the specific Scripture isn't mentioned, he follows the example of the Apostle Paul from I Cor. 7:8. He cares for the afflicted in the community. When young Huw is injured and thought crippled for life, Mr. Gruffydd visits him. He gives Huw the novel Treasure Island, telling Huw that he is jealous of the boy's opportunity to be in bed reading. But he also encourages Huw that the doctor's prognosis of never walking again is not the last word because "nature is God's handmaiden, and He's instructed her before to change course. Mr. Gruffydd later commands Huw to walk. He does; again, a worthy carrying on of apostolic tradition. Another major focus of the film is political -- a miner's strike. Some in Mr. Gruffydd’s congregation support the strike; some oppose it, so initially he hesitates to get involved in a "family squabble." Clergy hesitancy about getting involved in political debate is usually a good thing in my book. But when he is urged by some to speak his piece on the issue, he is even-handed, acknowledging the justice the union seeks but also calling for peacemaking and responsibility. I did have problems with his instruction on prayer to young Huw. When Huw begins to walk again, the Reverend tells Huw that he believes God has used the time of trial to build the boy's spirit and now he must be careful to guard his spiritual health along with his physical health. Mr. Gruffydd urges Huw to pray, and Huw asks how to pray. Mr. Gruffydd responds that prayer is simply "good, clear thinking." He doesn't exactly say he's talking about thoughts sent in God's direction, but I'll give the Reverend the benefit of the doubt on that. There's something to what he says, but on the other hand, Paul wrote in Romans 8:26 that "the Spirit helps us in our weakness; we don't know what we ought to pray, but the Spirit Himself intercedes for us through wordless groans." That sounds like a very different thing. And as I mentioned before, the Reverend gives quite the Whitewashed Sepulchers/Matthew 23 type sermon to the Pharisees in his congregation, so bully for him on that. So to sum up, the church in the film deserves to have the coal dust brushed from the Reverend’s shoes. And Mr. Gruffydd deserves a good flock. He's certainly a better spiritual example than Charles Foster Kane. Two steeples to the church in this film. 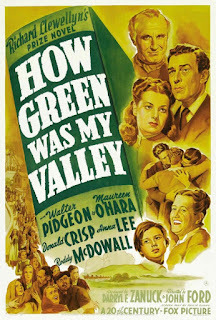 Recently we had the opportunity of visiting the hometown of the director of How Green Was My Valley, John Ford. He won the Academy Award for directing that film, which could join his award shelf with three other Oscars for directing. The city built a statue in his honor, along with small monuments to some of his most memorable films.